Winter weather headlines have been issued this afternoon. A winter storm watch has been issued for southern Maine and New Hampshire, a winter weather advisory has been posted for most of Vermont. Snow is expected to develop Sunday evening – after sunset. As the snow develops, most areas will see a quick burst, which may add up to an inch. We’re still expecting a change to rain for most areas, but the cold air will be slower to leave in northern New England. The areas under a winter storm watch have the greatest potential of seeing over 6”. The chilliest air of the season arrives this weekend for much of New England, with highs on Saturday only reaching the 20s in most spots. Sunday will only offer highs one or two degrees higher than Saturday, with clouds increasing over the course of the day. Those clouds will come ahead of our next storm, which brings snow by Sunday night. The snow will move in from west to east after dinner though, so the daylight hours are just fine for anything you have planned. We’ll see several hours of snow, moderate at times, overnight Sunday into very early Monday. At the same time a rain/snow line will take shape near the South Coast. That rain/snow line will work northward over the course of the morning. By about 5 a.m., rain or a wintry mix will be ongoing from Boston points south, with snow still falling and accumulating north and west of the city. By 9 a.m. that line will have worked through the rest of Eastern Massachusetts, Southeastern New Hampshire, and most coastal areas in Maine. In the hilly terrain of Western and Central Massachusetts, as well as much of Vermont, interior New Hampshire and interior rain we’ll still find snow. That’s where accumulations will be highest. The precipitation tapers off during the afternoon, leaving us with clearing skies for the Monday night Patriots game. When it’s all said and done, coastal Connecticut, Rhode Island, the South Coast of Massachusetts, Cape Cod, and the Islands are likely to see a dusting-1”. Remember, most of that will be washed away or turned into slush. 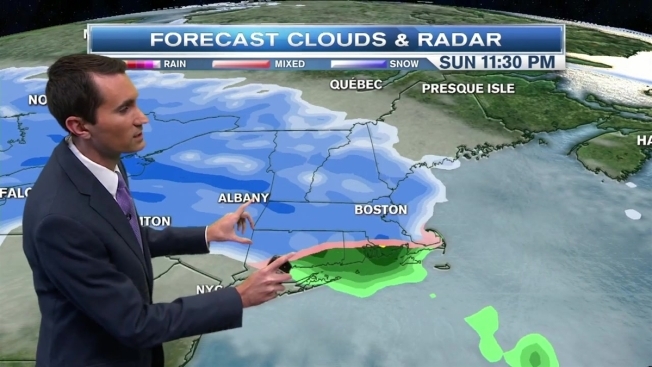 From Hartford to Providence, and then up in the Boston area, South Shore, and North Shore we’re expecting an inch or two of snow before the change to rain. 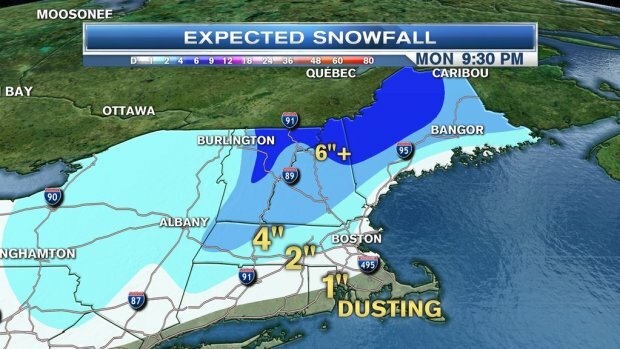 Similar amounts are likely at the New Hampshire Seacoast and along much of the Maine coast. At this time we’re expecting 2-4” in the hills of Northwestern Connecticut, and in areas along and North of the Massachusetts Turnpike. This includes much of the Worcester area. Plows may be needed here. Higher amounts on the order of 4-6” are right now expected in the highest terrain of Western Massachusetts, along Route 2 in the Bay State, and in much of Vermont, interior New Hampshire, and interior Maine. There will be some jackpot areas of 6”+ in the Northern Greens and in Northeastern Vermont, as well as parts of Northern New Hampshire and Maine. As usual, a small shift in the track of this system could change those amounts so we encourage you to stay tuned to the forecast.